This year we’re marking the 150th anniversary of the founding of the Borough of Huddersfield in 1868. This was an important achievement at the time, and it’s part of a rich democratic heritage in Kirklees that we can be proud of today. Several local organisations are joining in the celebrations and you can take part in some local events and activities, or learn more about Huddersfield’s civic heritage through exhibitions, publications and online resources. Huddersfield was granted a Royal Charter as a Municipal Borough on 7 July 1868. 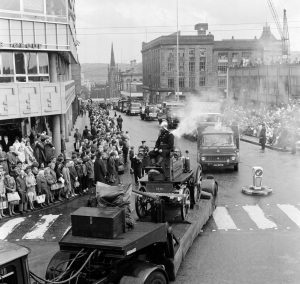 Compared with its neighbours, Huddersfield was 20 years late in achieving Borough status — but, within 15 years of inception, was managing markets, water and gas supply, tramways, the police force and fire brigade, some of the country’s earliest Council housing and much more besides. 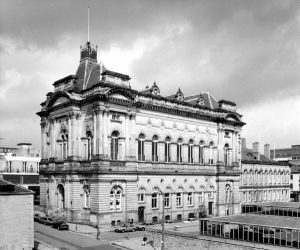 The Borough continued its pioneering in a wide range of public services before handing over to Kirklees Metropolitan Council in 1974. A new Discover Huddersfield guided walk — Civic Celebration Trail (PDF) — has been prepared by David Griffiths of Huddersfield Local History Society. 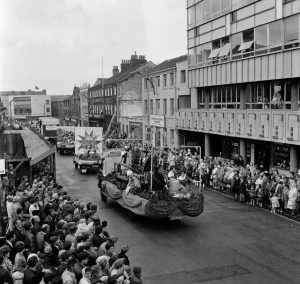 The 100th anniversary of the Borough of Huddersfield was celebrated throughout 1968, but arguably the highlight for many was the Centenary Pageant Parade which took place on Saturday 22 June and you’ll find over 250 photographs here. If you took part in the parade or if you stood in the rain to watch it, we’d love to hear from you!